How has the Hohner Marine Band changed over the years? The Hohner company has produced more than forty different models bearing the name Marine Band over the years, ranging from simple Richter diatonics with twenty reeds, to huge multiple tremolo instruments with almost almost two hundred reeds and all sizes and types in between. 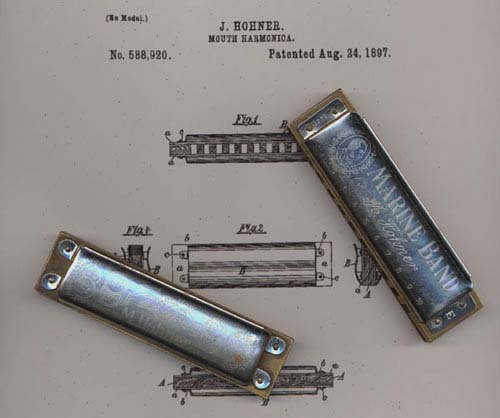 However, the one that concerns us here is their model number 1896, Hohner's best-selling diatonic and probably the most well-known harmonica in the world. Its design has changed quite a bit over the last century and I have attempted here to draw up a chronology of its evolution. Clicking on the links under each picture will open new windows with close-ups of various parts of each instrument. The covers on this instrument are "upside down" compared with the current incarnation of the Marine Band, ie. if you hold the instrument with the low notes to the left, Herr Hohner's portrait is on the lower cover. For what it is worth, the name Marine Band was registered with the German Trademark Office as DRWZ 14708 in 1896 (the application was made January 30th and granted March 13th) and with the United States Patent and Trademark Office as Trade-Mark 28,228 (application filed March 21st and granted May 5th). In the US filing, they claim that Marine Band had been in continuous use since January 30th, 1896. 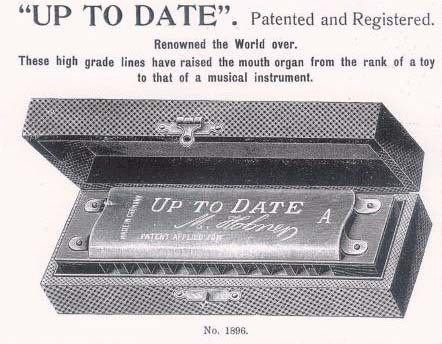 Hohner registered the name Up To Date as DRWZ 16213 later that same year (application made March 38th, granted May 5th) and trademarked the number 1896 with the USPTO in 1902 (Trade-Mark 38,458, filed May 16th, granted June 17th). I have so far been unable to locate any similar legal protection for the name Marine Orchestra. For the rest of this article, I shall confine myself to physical examples of the instrument, rather than catalog illustrations. The covers on this instrument are nickel-plated brass and still have the trademark on the top and Hohner's picture on the bottom, the trademark having a small six pointed star inside the circle. 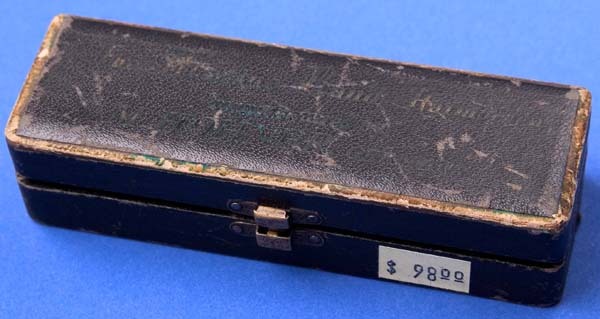 This next instrument came with a booklet in its case that was dated 1905 and the design of the label inside the lid of the case was trademarked in 1907 (DRWZ 101069). Aside from the boast of U.S.A. PATENT AUG. 24th 1897, the covers on this one seem identical to the previous model, however the combs are very slightly different, the earlier one being 4 1/16 inches long and the later one being 4 1/32 inches. Our third example dates from some time prior to WWI and displays several changes from the previous model. Although the comb is the same length, the covers have changed substantially. The six point star in the middle of the trademark is slightly larger and there are doubled circles around the WIEN and PHILAD. medals, single circles around ULM and STUTTGART medals. The covers now have a substantial lip at the rear opening and the cutouts at the end of each cover are slightly smaller. More importantly, they are no longer made of brass, but of what appears to be some sort of nickel alloy, possibly what is known as German Silver. 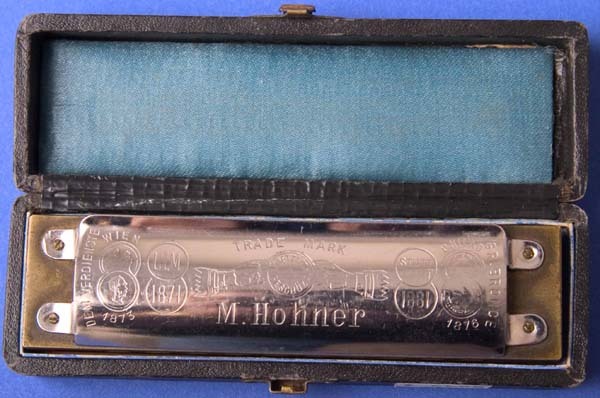 The covers on this one are made from nickel plated mild steel and now Herr Hohner appears on the upper cover and the trademark on the lower cover. There are some slight differences in the engraving and the design of the hands in the trademark is considerably different and all the medals now have doubled circles around them. Also, hole numbers appear on the upper cover for the first time. Although the covers are still lipped at the rear, the opening is noticeably wider. The cut-outs at the ends of the covers are taller, but not as wide as on the previous example. The box now has #1896 added to the design on the top and a label on the bottom boasting of the quality of their instruments and of their award at the 1915 San Francisco Exposition. The harmonica is slightly smaller than the preceding specimens, measuring 4" x 1", with the mild steel covers 2/3" deep at the front, and 3/4" at rear. On the upper cover, the wreath is slightly smaller and the placement different, the signature is also smaller and the patent dates are placed more to right than on the 1923 model. The medals on the lower cover now have single circles, the star is smaller than on the previous version, with the hands and cuffs also slightly different in style. Some time in the mid to late 1920s the design of the box also changed, with a picture of the US Marine Band being pasted to the top of the box. The labels on the inside of the lid and bottom of the box were unchanged from earlier versions. The only significant difference between this one and the previous model, is that cuffs in the trademark have lost their jagged ends. The covers are similar to the previous one, but for the trademark now has a larger star once more, much shorter cuffs and all the medals back to having doubled circles again. Also the words DEM VERDIENSTE (alongside the WEIN medals) have now been abbreviated to D. VERDIENSTE. The cutouts at each of the covers are larger and more angular. More significant is the introduction of a groove towards the front of each reedplate to accept the front edge of the covers. Also the comb is now shorter than any of the previous models, a fraction under 4 inches long. The most obvious change is with regards to the covers. Rather than a pair of tabs at each end of the cover, there is a single tab at each end the full width of the cover. The upper tabs now bear the key of the harp at the right and A440 at the left. The U.S.A. PATENT AUG. 24th 1897 and MADE IN GERMANY claims are no longer present on the upper cover and the lettering of the name MARINE BAND is substantially larger. The rear of the covers still have the lipped edges, but these lips have been folded back against the inside of the covers. The trademark has more subtle changes. The hands and the star are just slightly different from the previous version and the WIEN and PHILAD. medals have gone back to single circles, although the ULM and STUTTGART medals still have double circles. The harp also has a much slimmer profile top to bottom than previous versions. When I first wrote about this next example, I described it as being "something of an oddball". However, I have since learned that this is by no means an uncommon specimen. I assume from the presence of the star in the trademark that it dates from before WWII, however it also has a few features that are normally associated with post-war models. The lips at the rear of the covers are still flattened, making the harp more open at the rear, but the M. HOHNER on the lower cover is slightly shorter than on the previous examples and where it used to say MADE BY and GERMANY on either side of the name, it now says MADE IN GERMANY and FABRIQUÉ EN ALLEMAGNE. To make space for this, the medals are all slightly smaller and have smaller lettering around them. Although the WIEN medals keep their single circle outline, there is a partial circle of dots inside this outline. The circle with the star has the words GESETLICH and GESCHUTZT in full, instead of the abbreviated forms GESETL. and GESCH. used on every other Marine Band I have seen. 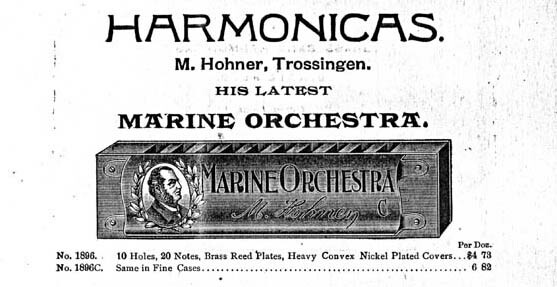 On the upper cover, the lettering is fractionally larger than on the previous examples, both for the name MARINE BAND and the Hohner signature. The picture of Matthias Hohner is slightly simplified compared with earlier versions and the laurel around his picture is also a little different. The A440 is a little bigger than before and the key on the right tab of the upper cover is now stamped into the metal, rather than engraved. I have two examples of this version. One came without a box, the other came in a box identical to the next example, but as the key stamped on the box did not match the key of the harp, it was obviously not the original one. It is similar to the previous one, except that the abbreviated forms GESETL. and GESCH. are back again and the lines between them are vertical rather than horizontal, making it identical to the postwar MB except for the presence of the star. The box has different labels to previous versions, both inside the lid and on the bottom. The lower label now gives the address as M Hohner Inc., New York City and offers a free instruction book and the inside label brags that the harmonica has been "scientifically tested". The most noticeable difference on the lower cover is the lack of the star in the trademark. The steel covers are similar to the later pre-war versions, although they give the harp a slightly thicker profile top to bottom. The covers still have the lips at the rear opening, but they are no longer flatted against the inside of the covers, which makes the harp much less open at the back. There were also a few changes to the box around the time of WWII. The picture of the US Marine Band is now printed directly on the top of the box, rather than being a separate piece of paper pasted on. The claim REG. US PATENT OFFICE is no longer present and NO 1896 is now printed directly under the word GERMANY instead of off to the left. The bottom of the box and the inside of the lid are also different. The address of Hicksville NY on this box dates it to some time after 1960 (Hohner US being based at Hicksville from 1960 to 1982). 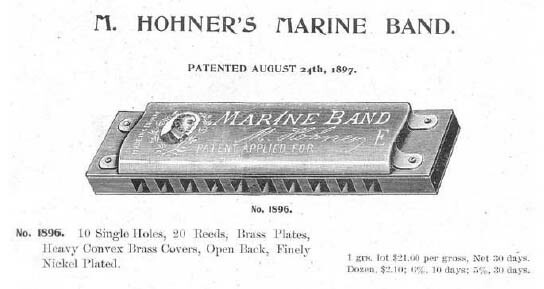 Up until the mid 1970s, the Marine Band was not officially distributed outside of the US, but upon being given worldwide distribution, the US address was removed from the lower label and the purchaser was advised "Ask your dealer or Hohner distributor". The Marine Band itself went pretty much unchanged between the end of WWII and the end of the 20th century, at least as for as its visual appearance was concerned, with some very slight changes to the picture of Herr Hohner and the size of the lettering on the top cover. At some point the comb material was changed from peachwood to pearwood, but I don't know how to tell the two woods apart by visual inspection. Likewise, there were various changes in the alloy used for the reeds and different reed profiles being used, although the lengths and widths of the reeds remained constant. The fine tuning of the instrument was also changed several times from the original 7-limit Just Intonation, to various more tempered tunings during the 1980s, then to something a little closer to Just Intonation in recent years. One change that is easier to spot is the number of nails used to secure the lower reedplate. Originally seven nails were used, but by the mid 1930s this had been increased to eight nails. After WWII this was reduced to seven nails. In the 1980s they were using six nails for the lower reedplate (although I have also seen a few examples that only used five nails on each reedplate). Then in the mid to late 1990s, at the same time as Hohner retooled and made dramatic improvements to the tolerances between reed and reedplate, they went back to using seven nails for both reedplates and also added a production code stamped into the reedplate. Another change occurred around 2000, when the nickel plated mild steel covers used for the last eighty years or so, were replaced with stainless steel covers. This has also lead to some more small changes in the engraving of the covers. The details might be a little too subtle to make out in the above pictures, but the designs have all been very slightly shrunk horizontally and very slightly stretched vertically. This is most notable with the circle in the middle of the trademark, which is now oval rather than being perfectly circular. Also, Matthias Hohner seems to have just a little more hair on the top of his head than he had in his previous portrait! The most recent changes were made around 2011, when sealed combs were introduced. These have a clear finish, rather than the traditional yellow/orange paint on the front and black paint on the ends and rear of the comb. Shortly after then, the "A440" was dropped and other small changes made to the designs on the cover. As I mentioned at the start of this article, there have been many other models made with the name Marine Band. There are a couple of them I would like to mention here are they both also bore the model number 1896. One is the Centennial Edition Marine Band which, as it's name suggests, was introduced in 1996 to mark the 100th anniversary of the introduction of the Marine Band harmonica. It was identical to the standard Marine Band 1896, except that it was gold finished and came in a special box. The MS Series as a whole went through various charges during the 1990s. The first production runs turned out some rather unresponsive harps with short lived reeds, but these problems were address with longer scale reeds, improved tolerances and a better reed alloy. There were also some changes made to the covers, most notably getting rid of the gaps at the ends of the front edges of the covers that had a tendency to snag facial hair. However, despite all these improvements, the Marine Band MS lasted for less than a decade, compared with twelve decades (and counting) of the hand made version. Footnote: I should add that this is very much a work in progress and I would love to hear from anyone that has any examples of variations that I have not covered above, particularly if you have any reliable means of dating them accurately. I would also like to take this opportunity to thank Joe Filisko for the loan of several of the pre-WWII examples shown above.